September frustrated both Bulls and Bears as momentum in either direction was short lived. It’s clear a stealth correction has been taking place most of the year. The correction started in small caps followed by international and emerging markets. With few alternatives other than large cap U.S. stocks investors have crowded into the same lifeboat. While Alpha Select sits well above its benchmark we still have a full quarter before year’s end. It’s too early to be popping Champaign corks. Two basic themes are dominating the landscape. 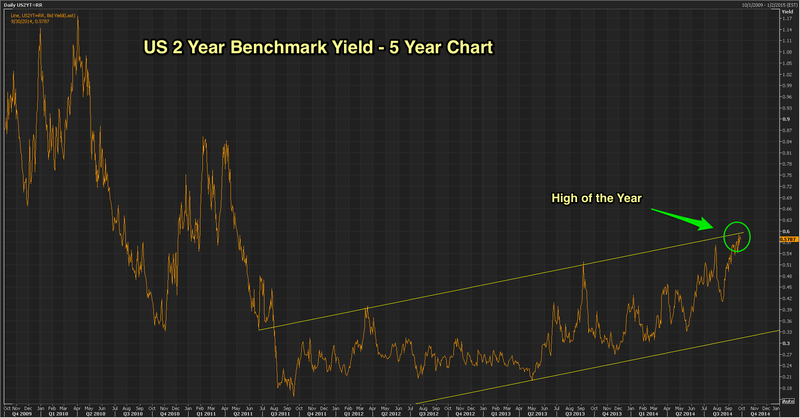 Number one with a bullet is falling 10 year benchmark yields. Investors need to understand why this is happening because the answer affects whether or not you even want to stay long the market. The knee jerk reaction is that the U.S. economy is rolling over. A second plausible explanation would be a flight to safety. While the economy certainly isn’t anything to write home about and geopolitical events are enough to frighten anyone into the safe haven trade it’s not the answer. I’m on board with bond guru Jeff Gundlach’s view that U.S. 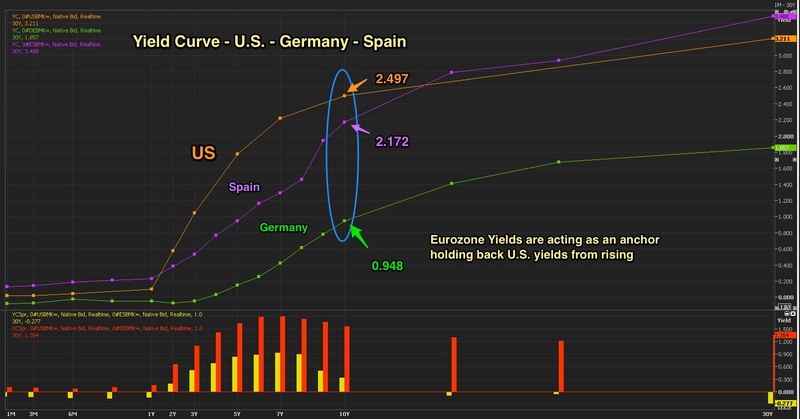 Bond Yields are being dragged down by the European bond market. Europe is in danger of a triple dip recession yet the German 10 year sits under 1%. No matter how much upward pressure there is for our rates to move north, the spread can’t get wider than it is today. Even Spanish 10 year yields are lower than U.S. Given that back drop the U.S. 10 year looks like a bargain in comparison. The short end of the curve tells a different story. Two year yields continue to push north. We can debate the timing of the Fed’s next move but its coming. The dollar’s rise to a 4 year high has caught traders and fund managers by surprise. The oil and commodity markets were the first victims along with stocks that act as proxies. Earlier this year when ISIS marched through IRAQ I incorrectly called for a potential energy spike as the conflict unfolded. While WTI and Brent prices did move higher initially the move was short lived as ISIS never made it into southern Iraq the home of the bulk of their production. As a matter of fact the opposite proved true. 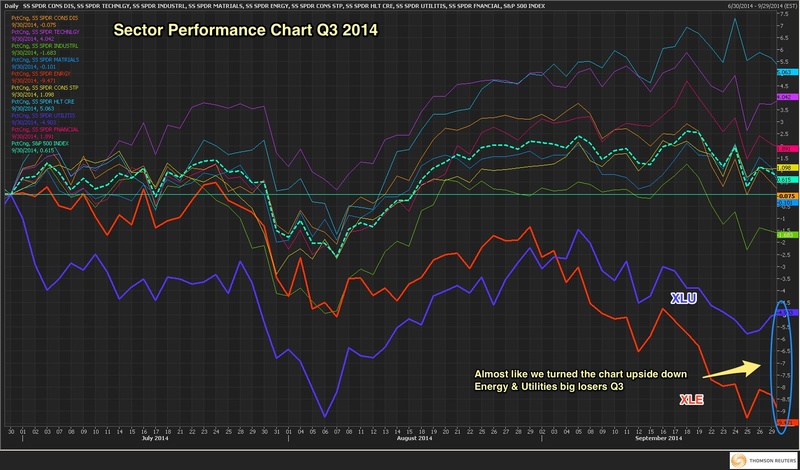 Energy prices have been in a consistent downtrend for the last several months. In addition the U.S. has made enormous strides toward energy independence with production now exceeding imports blunting the effect of these geopolitical concerns. While there are enormous pluses for a stronger currency it is certainly a drag on U.S. Multinationals trying to make a sales push into emerging markets. As the dollar rises our exports become more expensive for our overseas customers and the translation puts a dent in sales and earnings. Many corporations will choose to hedge the currency but of course this costs money. I’m going to be paying close attention to earnings conference calls looking for any loss of competitiveness as a result of the strong dollar. Sector rotation has dominated the action all year. 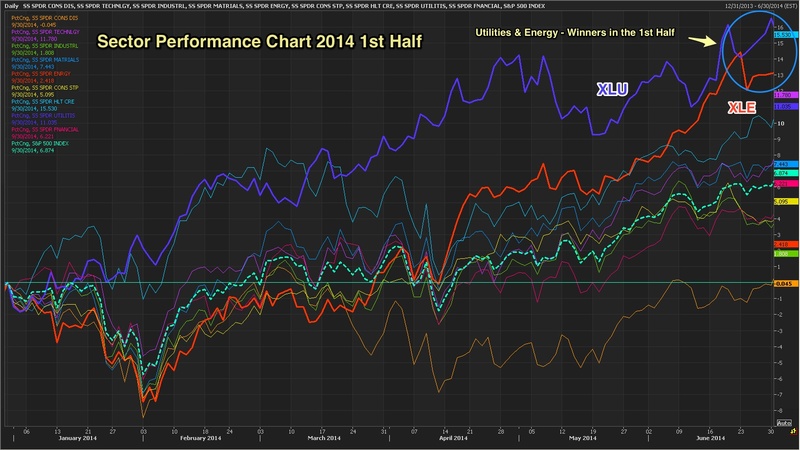 The first sector performance chart below shows Utilities and Energy leading the pack for the first half of the year. All that changed in Q3. It almost looks like you turned the previous chart upside down. Utilities (XLU) and Energy (XLE) weighed on the index down over (-4.9%) and (-9.5%) respectively. Of the stocks currently in the Alpha Select portfolios Southwest (LUV) lead the way up over +5% in September and close to 20% since its purchase in early August. Facebook (FB) and Skyworks (SWKS) were up +4.5% and +2.5%. On the negative side SCI Systems (SCI) was down (-4.6%) on the month along with Steel Dynamics (STLD) down (-5.5%) from our purchase earlier this month. (STLD) doesn’t have any exposure to Ford who just issued negative guidance but they still derive close to 20% of their business from the Auto sector. This along with a strong dollar could weigh on the shares so we’ll keep a tight stop from these levels. Gilead (GILD) topped the list of realized winners with our sale locking in an over 50% return in just a few months. Gilead continues to deliver and we may revisit the name at some point in the future but for now we’ve taken our leave. The realized losers list was dominated by those in the energy sector with Halliburton (HAL) topping the list down (-9.3%) followed by Western Refining (WNR) and Silica (SLCA) down (-7.5%) and (-7%) respectively. Currently our only energy position is Patterson (PTEN) which is flat since inception. What do we go from here? Alpha Select stock portfolios are currently just under 10% cash. This isn’t a hedging decision but merely recognition that it is getting harder to find stocks that rank high in the Alpha Select Quant models and meet our hurdle rate to get added into the portfolio. Currently our tactical asset allocation programs are running almost 50% cash so it’s hard to make the case that we should be pressing the pedal to the metal. I’ve written in recent posts that U.S. Large Cap stocks have become the safe haven but as any sailor knows if you put too many people into a life boat it sinks. Like the captain of a ship portfolio managers come into the start of the year with maps, weather reports and most of all a sound vessel that is continually maintained as they set sail into unchartered waters. 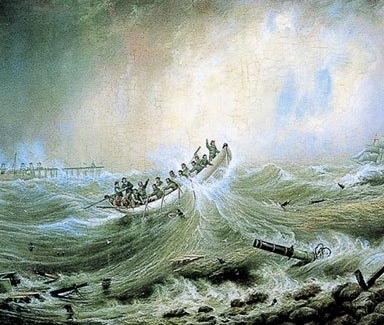 As weather and conditions change the captain must give orders to change course and sometimes put out the inevitable fire even throwing some cargo overboard. The job is to get your passengers to the Promised Land safely. We reached the shores of (SPX) 2000 well ahead of schedule and of course the call from the passengers was to push on to 2100. We’ll get there but my confidence on the timing is low. As we kick off the 4th quarter we have a lot to digest. The first reported case of Ebola has hit our shores. Today’s ISM and Construction Spending will get a close look and of course all eyes will be on Friday’s Employment report. Adding to the excitement we are now heading into earnings season with Alcoa (AA) kicking off the festivities next week. In other words we have a lot of work to do. Regarding Alpha Select Performance: Performance data quoted represents past performance and does not guarantee future results. The investment return and principal value of an investment will fluctuate so that an investment, when withdrawn from the strategy, may be worth more or less than a client’s original investment. Referenced performance is from a client’s account (model account. Performance is inclusive of all dividends, costs, commissions and the deduction of a 1.00% annual management fee (deducted quarterly in advance). match or outperform any particular benchmark. Performance reported is not GIPS compliant and has not been audited by a third party. Policies for valuing portfolios, calculating performance, and preparing compliant presentations are available upon request. Data as of 09/30/2014.